It's early Saturday morning and a fleet of bright yellow three-wheelers motors across the Mozambican capital in the direction of its slums, the vehicles piled high with copies of Jornal @Verdade  a free, weekly newspaper that in just two years has become the country's most read. 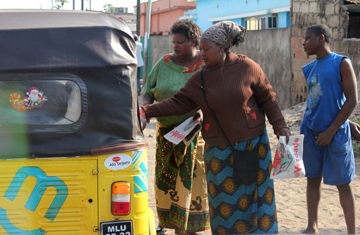 As the tuk-tuks, or txopelas, reach Maputo's ramshackle fringes, people rush to grab their copies, chasing after the moving vehicles with outstretched arms and crowding around them when they stop. With a weekly readership estimated by the paper at around 400,000, Verdade  meaning truth in the nation's official language of Portuguese  reaches far more Mozambicans than any of the country's other papers, says market-research company GfK Group. But while many publishers would be satisfied with creating a popular, free, quality newspaper, for founder Erik Charas that's just the beginning: the 36-year-old homegrown entrepreneur believes his paper can be an instrument of social change, one that will help lift the country out of poverty and end its dependence on aid. "We didn't start a newspaper to become a great newspaper," he says. "We started a newspaper to achieve transformation in the country, to push the issue of access to information and ultimately ... to engineer or create ambition in Mozambicans." Seventy-five percent of Mozambicans live on less than $1.25 a day, making most of the nation's best-selling papers, which go for between 45 cents and 75 cents, an unaffordable luxury. "With Verdade, people can buy food and get the news," says Charas. "They don't have to choose." Founded in 2008 with about half a million dollars that Charas raised from previous business ventures and private investment, Verdade now has an editorial staff of 15. Along with advertising income, the paper brings in revenue through its txopelas, which double as taxis, and from partnerships with mobile-telephone providers (the paper encourages readers to text in with news, comments and requests for advice). Leaving coverage of high-level politics to other papers, Verdade focuses on the issues that affect those on Maputo's fringes: bread subsidies, electricity prices, crime in the slums and HIV/AIDS. "I've never bought a paper. I've never had the opportunity," says Enia Tembe, 29, a washroom attendant in a Maputo shopping mall who earns about $70 a month. "Verdade helps us to see what's going on." But surprisingly for a paper sold in a country that has had its economy devastated by 16 years of civil war, the 32-page, full-color Verdade also carries reviews of the iPad and luxury cars, products far out of the reach of its target market. Aspiration, Charas believes, is the key to Mozambique's reinvention. "If you have ambition, you'll want things for yourself, you'll act on them," he says. "And ultimately the country will benefit." The @ symbol in Jornal @Verdade is Charas' benchmark for success: when Mozambicans are digitally literate enough to recognize the symbol as part of an e-mail address, he will have done his job. But critics aren't convinced that Verdade can fulfill its own ambition of changing the nation. Gil Lauriciano, a local journalist, notes that his cousin who lives in a poor neighborhood on the outskirts of the city is too busy surviving to think about owning an iPad. "When there's a big gap between the item and the person's reality, they don't aspire to it, they simply admire it," he says. And while Fernando Lima, chairman of Mediacoop, which publishes the independent weekly Savana, applauds Charas' "great initiative," he questions whether Verdade's content and language are in tune with its target audience. "Are [people] taking those newspapers because they're free or because they enjoy those newspapers?" he asks. So is Charas a naive dreamer? A study of voter education in Mozambique co-conducted by Oxford University professor Paul Collier says no. Collier, author of The Bottom Billion, a book about development and the world's poorest, ran the study during the country's October 2009 presidential elections to look at the correlation between access to information  through Verdade and other sources  and voter turnout. After the election, researchers asked Mozambicans to send in SMS messages to Verdade with their policy priorities for the new President-elect, which the paper promised to deliver to him. The study found distribution of Verdade had increased voter turnout by almost 10%, and that those who received the paper had a 10% higher probability of sending an SMS addressed to the President. Collier believes that reading Verdade's stories about issues affecting their lives and about a world beyond their own encouraged people to ask questions of their government. "People were seizing this opportunity to have a voice," he says. "They were looking to the authorities ... to deliver some prosperity." The fact that people sent in messages asking about better health care, education and other services makes Charas optimistic about Verdade's impact on Mozambique's future. "We could see that access to information really does empower," says Charas. "It really makes you act on the knowledge [you've gained]." It seems that as a potential driver for change, the truth is priceless.